Like the other small breeds, the Havanese has always led the simple life as a companion and was a high-status symbol kept almost exclusively by the wealthy families of Cuba. Today they are recognized as the National Dog of Cuba and are the only surviving breed from that country. ​The Havanese is one of several breeds included in the bichon family of dogs, the others being the Bichon Frisé, Bolognese, Coton de Tuléar, Maltese, Löwchen, and Russian Tsvetnaya Bolonka. 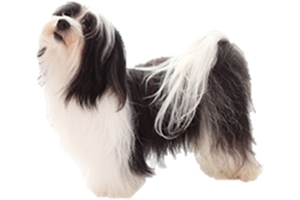 There is a short coated variety of the Havanese sometimes knowns as the Shavanese, however this variety is considered unacceptable by all major kennel clubs. The Havanese is the modern descendent of the extinct Blanquito de la Habana, another bichon-type of dog that was previously found on Cuba. How the Blanquito de la Habana’s ancestors arrived on the island is debated, along with their identity. Since bichons were favored throughout Europe by the wealthy and upper classes it is likely that several dogs were used in their makeup. A large portion of Cuba’s human population did arrive from the Canary Islands, which would mean the basis of the stock was the Bichon Tenerife. In the 1800s the Cuban aristocracy began importing Poodles from Germany and France, desiring to emulate the higher classes in continental Europe. These Poodles were crossed with the Blanquito de la Habana and paved the way for the modern Havanese. Since they were no longer solid white the name blanquito no longer accurately described them and they became known as the Bichon Havanais. The Havanese remained a pampered favorite of wealthy Cubans until Castro's regime in 1959. Falling out of favor it became rare and was only saved by a handful of Cuban refugees arriving in the United States. In the 1970s an American breeder named Mrs. Goodale took an interest in the bred and worked to acquire 11 dogs she used to establish a breeding stock. Although a handful of imports have been obtained virtually all Havanese in the United States and Europe descend from these dogs. Today the Havanese has one of the fastest growing populations of all the American Kennel Club (AKC) breeds. Although it was only recognized by the AKC in 1996 by 2014 it was already ranked as the 25th most popular breed. Is the Havanese Right for You?